– without Leaving Your Ministry! What neglected ministry skill training most powerfully changes pastors – thereby strengthening churches – causing them to more faithfully fulfill the Great Commission by becoming more intentional and effective in their disciple-making? Biblical counseling – or, more broadly, soul care – training, of course! Can YOU do this – without leaving your current ministry? YES! But you probably would be helped by a tried-and-proven curriculum, contacts among foreign national leaders, and a support team of experienced biblical counseling trainers, right? 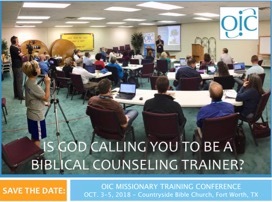 Attending our OIC Missionary Training Conference (Oct. 3-5, 2018; immediately following the ACBC Annual Conference in Fort Worth, TX) will prepare you to serve pastors and Christian leaders in other nations as an OIC Missionary. What Is an OIC “Missionary”? Our “missionaries” are those who are authorized to represent OIC in the nations. Their authorization is gained through attendance at our OIC Missionary Training Conference, approval of their local church leadership, and approval of the OIC Board of Directors. However, unlike most other missions organizations, OIC has a “Spectrum of Involvement.” While we do have full-time missionaries, both Americans and foreign nationals, most of our missionaries serve one or two weeks twice a year, allowing them to remain in their current ministries as pastors and biblical counseling center directors. Why Attend the OIC Missionary Training Conference? I also asked our current, experienced directors: What do you really appreciate about your ministry with us? How Can I Apply to Attend the MTC? The first step is to access and complete our OIC MTC Interest List Questionnaire. We’ll be in touch! We’ll also ask you to submit a letter of recommendation from your pastor or, if you’re a pastor, from a member of your local church leadership team. What other information would be helpful to you as you prayerfully consider attending our MTC and working with OIC?